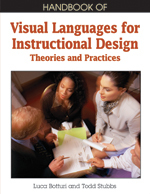 This chapter is a survey of the literature of ID to look at the breadth and usage of design drawings in this discipline to better understand the emerging use of VIDLs to improve designs. To conduct this research, we sampled several ID textbooks, ID journals, software, and case studies looking for examples of design drawing. Design drawings found were then categorized using Gibbons’ (2003) seven ID layers as a taxonomy to understand the drawings purposes. We did not find the same pervasiveness or level of self-awareness as found in other design fields. Examples of design drawings were found, but were somewhat rare. Furthermore, we discovered that those examples we found tended to document only two of Gibbons’ seven layers, indicating narrow application. We believe this gap represents a serious shortcoming in ID, indicating a lack of tradition, skill, and standards for visual representations of design except in limited ways. At present, design drawing is a rare but growing phenomenon in ID, which, when fully understood and implemented, can only benefit the practice of ID.